While dining at Goulette, there is a consistent sense of being at the home of a gracious host, more than a stranger in a city restaurant. My first visit was on a slow Saturday night. When I inquired with the friendly, entertaining server as to ‘must tries,’ after a pause, he singularly concluded, “The shrimp roll ($11.50) is excellent.” And it is. Essentially a lobster roll, but made with shrimp, the sandwich otherwise adheres to tradition. 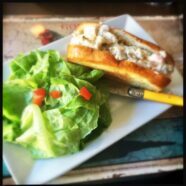 The delicate seafood is mixed with bits of celery and lightly dressed with mayo, dill, and then loaded into a buttery roll. The menu identifies lobster oil, and although I didn’t specifically notice it, I’m confident it must have added to the deliciousness factor. The roll is accompanied by some ubiquitous, hydroponic Boston lettuce. Topped with what appears to be mayo and a tablespoon of chopped tomatoes, it’s bitter, but otherwise flavorless — I don’t get it. Arriving at 5:30 p.m. the following Saturday, I was a little surprised when the waiter asked if I had a reservation. Glancing around, reservation cards were on many of the empty tables, but Charleston doesn’t really start eating until at least 7:30 p.m. right? Despite the initial concern, I was quickly seated. The radio is tuned to ’80s New Wave and every, single, solitary entree comes with French fries and the same forgettable salad … I also don’t get that. But maybe I’m just not the intended audience, as come 6:05 p.m., suddenly surrounded by a sea of AARP members, the whole reservation conversation started to make sense. Further contributing to my head scratching, the warm cheese salad ($9), finds a pile of said hydroponic greenery adorned with four slices of baguette topped with some semi-melted cheese. There’s one with brie and another with blue cheese, along with goat and morbier. If you tend toward dilemmas involving ordering the cheese plate versus sticking to your cleanse and eating undressed lettuce, vacillate no more. I will say I was cautioned about the vegetable soup ($6.50). “I don’t like root vegetables,” the attentive, good-natured waiter offered, wrinkling up his nose. Too subtle of a warning, mon ami, but I appreciate the effort. 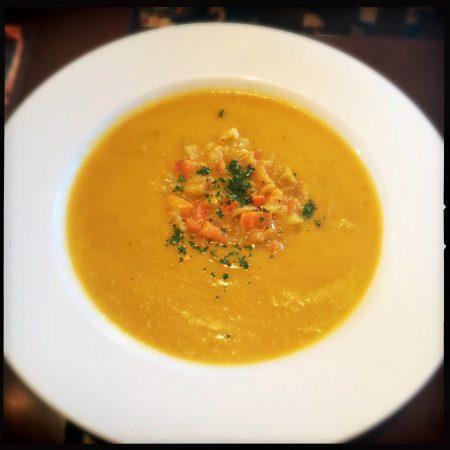 Bright orange in color, the soup is pureed, yet topped with a mound of chopped carrots and potatoes. Gentle and soothing at first, it starts with the creamy flavors of potato, leek, and butter. Then the carrot comes and stays, and the whole thing finishes with some harsh garlic notes. 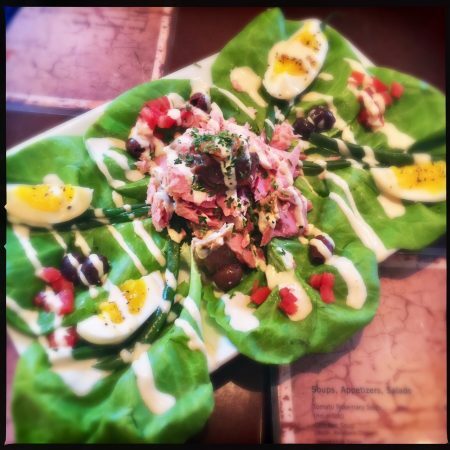 There is not, gratefully, any butter lettuce, although in my mind’s eye I imagine the chef hesitating over the dish, a bright green leaf in his hand. Goulette is owned by the former La Fourchette’s Perig Goulet, and he’s all over the front of the house here, playing the spoons for a table one minute, greeting seeming old friends the next. He even materialized out in the street, directing a wayward semi-truck driver monkeying up traffic. Although my dinners did not come with a show, he certainly seemed like a warm and welcoming host with those he visited. 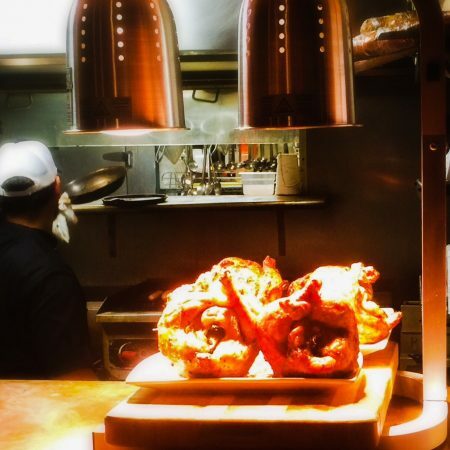 It’s hard to say how much he’s involved in any cookery, but perhaps he had a hand in the earlier preparations of the rotisserie chicken ($19), stacked five high under a heat lamp at the start of dinner service. I realize it takes time to roast a chicken, but the whole heat lamp thing seems like an inadvisable bit of backstage magic to share? Case in point, during the two hours in which I dined one night, only one ever made it out of the heap. 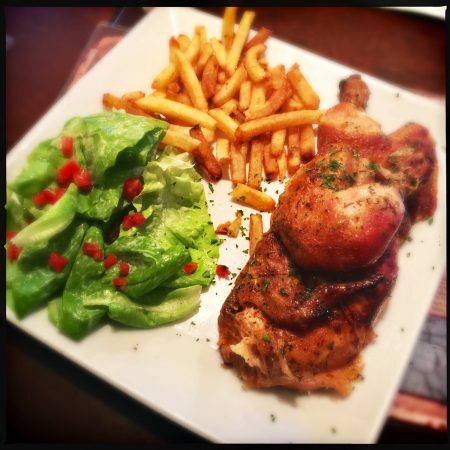 However, my own chicken — and Goulette provides you with an entire chicken — was still fresh enough to be juicy. Nicely seasoned and dusted with herbs, in a world filled with rotisserie chicken, it’s above average, but not spectacularly so. The menu doesn’t indicate that it’s an organic, free-range, locally-sourced bird named Colin, so perhaps that’s why it’s only marginally more special than your average Costco offering? It’s accompanied by some outstanding, twice-fried duck fat fries and — you guessed it — imperceptibly dressed hydroponic Boston lettuce. The restaurant has an extensive wine list and a sole cocktail creation — the French Pickler. Although I turned it down upon hearing the description (vodka and pickle juice), we were brought a complimentary sample complete with gherkin pickle floater. Mon dieu. I will say this: You cannot taste the vodka. The former Lana space is as welcoming as its owner and host, with tables and screens in place of the imposing wooden banquettes. A large exposed pipe has been painted a bright, cheerful blue, while a few potted plants add to the warm, neighborly feel. The Nicoise salad ($11.50) is made with tuna confit and does a good job at scratching that French food itch. 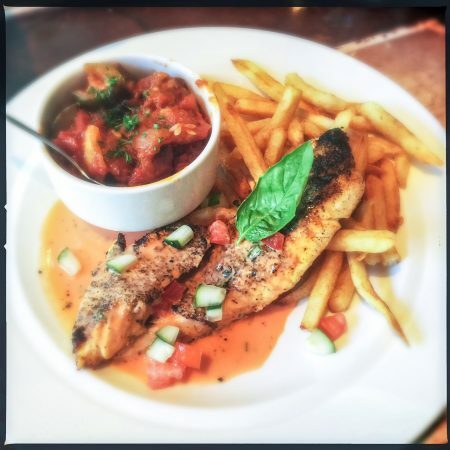 Rich and decadent with almost no fishy flavor, the confit is in large portion in the center of the plate. It sits atop eight leaves of butter lettuce which are also dotted with bits of tomato, Nicoise olives and sardines, as well as some al dente haricots verts and a lovely, creamy boiled egg. The traditional potatoes are notably missing, but all told this is an enjoyable choice. 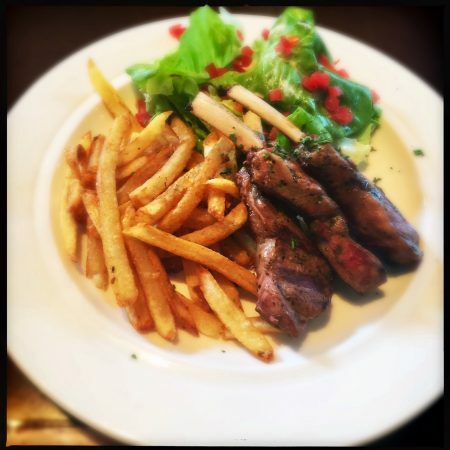 Meanwhile, the grilled hanger steak ($25) comes with the usual fries/lettuce. It’s a diminutive serving, pre-cut into four slices. Cooked to order and topped with a generous splash of garlic butter and fresh parsley. There was an inexplicable 10 minute wait for the green peppercorn sauce ($3.50) we had ordered to accompany it. When it finally arrived, the sauce itself was, well, weird. It started with a sweetness reminiscent of butterscotch pudding, causing the finishing notes of sharp green pepper to feel particularly aggressive in comparison. The grilled lamb chops ($26) were excellent in terms of flavor, but served in a Lilliputian portion. Nonetheless, the three, tender, bone-in chops were less gamey than most and imbued with a lovely smoke flavor. Once again accompanied by the omnipresent lettuce/fries combo, it’s probably best to order this pint-sized portion while sitting within grabbing distance of someone with an entire chicken. 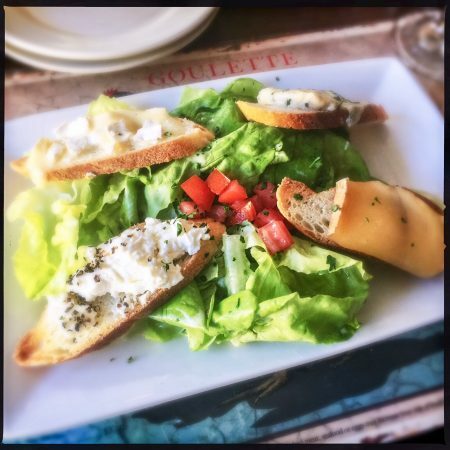 Between the price point, disparate portions, and possible stock options in hydroponic lettuce, I’m a little worried about Goulette’s success in such a competitive restaurant scene. But perhaps, again, I am not the intended audience, as the crowds on my second visit indicate owner Perig Goulet’s obvious popularity may be all he needs to keep the tables full and the heat lamp on.